This week we hear that not everyone is getting along so well onboard our ships. A ‘disagreeable quarrel’ has broken out between the chief mate and the carpenter onboard. Meanwhile George Kingston and Captain Lipson have had yet another row onboard the Cygnet. We’ll have a look at the types of situations that lead to conflict onboard and the strategies used to solve problems between people onboard. At sea in the ‘Africaine’, 1836. by John Michael Skipper. Courtesy of the Art Gallery of South Australia. What types of conflicts might occur onboard? How might conflicts have been resolved? What was the captain’s role in resolving conflict? Find out about the penal systems in England at this time. 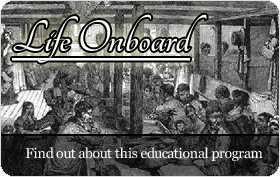 What were the laws and punishments that the passengers and crew were used to living by in England? Explore the historical concept of cause and effect in relation to the conditions in England and the establishment of British colonies in Australia. How did the overcrowding of British prisons effect the British colonisation of Australia. Did these issues have any impact on South Australian history? Form questions to guide research into crime and punishment in 1836? What crimes were punishable by law in England in 1836? How does this compare to 2011? What was happening in other parts of the world at this time? Look at prison records from a London prison. Use this source to compile a list of the most common crimes committed at this time. Consider the reasons why these crimes were so prevalent at the time. Read Captain Martin’s recount of the conflict between the carpenter and chief mate over a packet of nails. Re-write this journal entry from the perspective of the carpenter, the chief mate or an observing passenger. Create a ‘wanted’ poster for a person guilty of committing a common crime in 1836 in England. Include information about the expected punishment for committing this crime. How is conflict dealt with in your classroom, school,home and community? How could the carpenter and chief mate have used these rules and strategies to resolve their conflict? Work with a partner and create a role play to show how the situation between the two crew members could have been resolved. Make a list of all the things that really annoy you now. Do you get annoyed by something your brother or sister does? When you miss the bus, lose something or your best friend hurts your feelings? Now imagine that your family and class are crammed together in a cabin about the size of a small bus and have to live together for weeks on end at sea. What kinds of things do you think would annoy you now? Are they the same as the things on the list? What sorts of things could you do to help you feel less annoyed by those around you? Choose one of these scenarios(or one of your own). Set up a classroom courtroom and make decisions as a group about appropriate consequences and solutions for these situations. What factors would be important to consider when making a judgement? A passenger in your cabin eats more than their share of the food. A passenger in your cabin is caught stealing a blanket.A passenger in your cabin refuses to take their turn in sweeping the floor.A passenger in your cabin makes rude remarks about another passenger’s wife and a fight breaks out between the two.A passenger uses drinking water for washing clothes. Consider what prisons were like at this time. 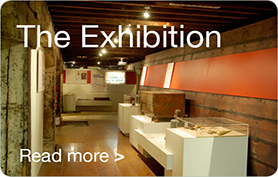 Visit the Adelaide Gaol and check out what was happening in London prisons. Consider how living in confined space impacts on people’s well-being and emotions. Divide your classroom in half and attempt to spend a whole day using only half of your classroom. What effect does this have on you? How well do people get along? Is it different at the beginning of the day compared to the end of the day? Does the teacher have to work differently to manage the class? What other issues does having less space present for the class? Are there any advantages? Create a PMI to record what happened during this day. Make a list of all the crimes you can think of and rate them in order of how serious you think they are? What do you think an appropriate punishment or consequence should be for each crime? Should all people committing the same crime be given the same punishment or are there other circumstances and factors that need to be considered? How would the conflict with the carpenter have differed if it was the captain or a passenger who complained about the nails? The longer the journey the more conflict there would be between passengers. Next week we join the John Pirie where there are concerns for the health of one of the passengers. We will take a look at what happened when people got sick onboard. What kinds of illnesses and diseases were people suffering from and how were they treated?